However, medical experts have said that the age-old practice is actually fraught with dangers. Ewedu is also known as Rama ayoyo among Hausa, while the Igbo call it Kerenkere. Dr. Adegboyega Akere of the Department of Medicine, University College Hospital, Ibadan, on Wednesday, advised women and caterers to desist from the practice. Akere, a Consultant Gastroenterologist, told the News Agency of Nigeria in Ibadan that food handlers should always use blender for ewedu and every other ingredient used in cooking it. “They should not use broom to mash the vegetable,” he said. Akere said this is because ewedu soup that is mashed with broomsticks could still retain splinters of the broom, however minute. He said that when eaten, the splinters from the broomsticks could get trapped inside the oesophagus or the intestine. Akere disclosed that someone who had eaten the soup containing a tiny piece of broomstick was rushed to the UCH recently. “The broomstick settled in her intestine and did not digest. This resulted in the inflammation of the intestine. “Two days after, the patient complained of severe stomach pains and a CT-Scan revealed that a broomstick was lodging inside her intestine. “A surgical operation was carried out and in less than 24 hours, the patient was on her feet moving about. “This clarion call is necessary because ewedu soup is the local soup of people in this part of Nigeria. “The locals prefer it to any other soup; therefore, I will advise them to either blend or grind it on the stone before cooking,” he said. Akere also warned that when someone ingests strange objects, they could develop gastroenterology-related diseases. “Mothers must also be careful while preparing this soup, as it is the most common among the locals in weaning their babies,” he warned. 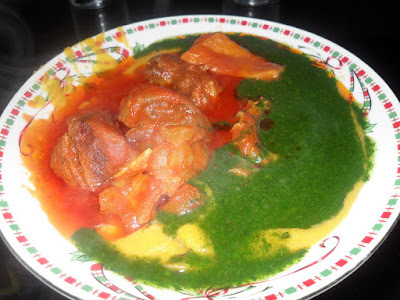 » What Would You Do If Restaurant Served You This And Called It Plate Of Amala With Gbegiri & Ewedu?